The glorious fall colors in California wine country aren't good news for the industry. Although they look beautiful in the muted autumn sunlight, red leaves on grapevines can be a symptom of serious plant diseases, such as grape leafroll associated viruses and red blotch. 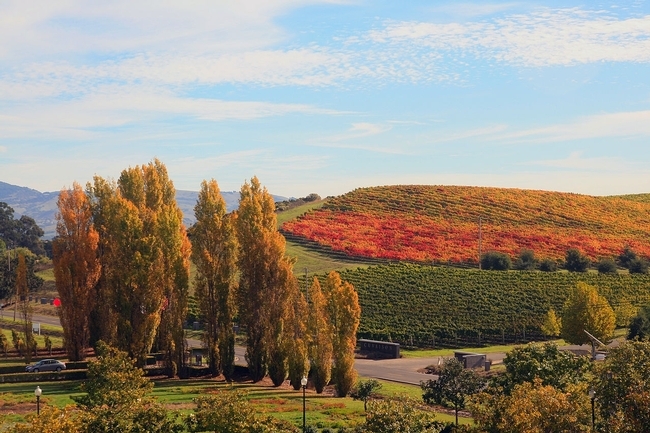 In 2008, a disease characterized by red blotches along leaf margins and red veins under the leaf surfaces was seen in red grapes growing in Napa Valley. The symptoms resembled leafroll disease, however laboratory tests did not detect any leafroll and rugose wood viruses in the samples. 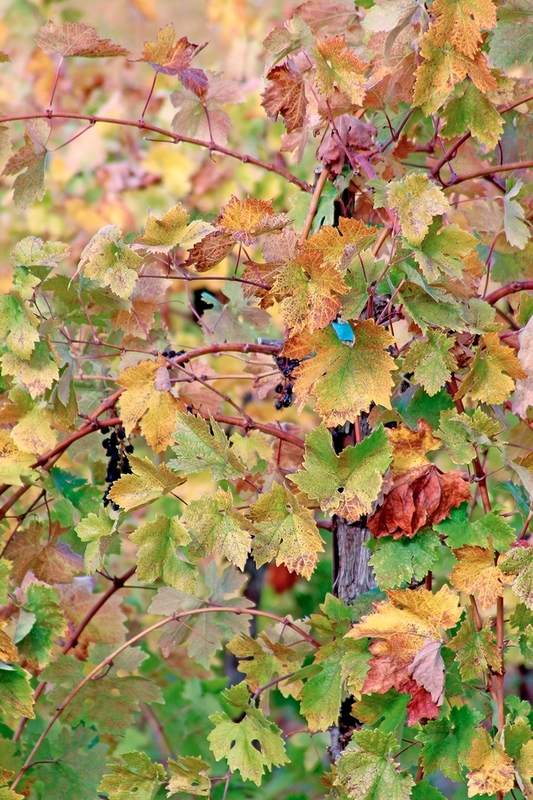 Since then, red blotch disease has been observed in vineyards throughout North America. The infected grapevines may produce clusters with reduced sugar content, causing delayed harvests. Poor color development and increased acidity are found in some clusters on diseased vines. A virus associated with red blotch disease was identified in 2012. The incidence of the red blotch disease relative to other virus diseases is currently not known, according to the UC IPM Pest Management Guidelines. The guidelines, produced by UC Agriculture and Natural Resources' (UC ANR) Statewide Integrated Pest Management Project, offer comprehensive information free online for pest control in more than 50 California crops. UC ANR Cooperative Extension specialist, Deborah Golino, director of Foundation Plant Services at UC Davis, wondered if the virus associated with red blotch disease was new to California. She turned to the UC Davis Herbarium, a repository of 300,000 pressed plant samples, including grapevines dating back to 1940. Golino and her laboratory staff collected 56 samples and, to prevent contamination, tested them in a lab that only works with lettuce. Of the 56 samples, one, an early burgundy collected in Sonoma County, was positive. The results were published this year by the American Phytopathological Society in the journal Plant Disease. An initiative to manage endemic and invasive pests and diseases is part of UC Agriculture and Natural Resources Strategic Vision 2025.